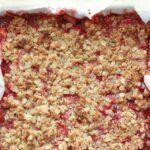 An abundance of fresh strawberries, crisp buttery brown sugar covered oats, and chewy sweet coconut are layered into this simple fruit dessert. My husband, kids, and our friends all raved about this dessert and there was only a small serving left the next day. I served this with homemade vanilla ice cream the day that I made it and I finished it off the next day, a sliver at a time. These bars were heavenly with the ice cream and they were also awesome all by themselves. Preheat the oven to 400 degrees. Line a 10" square baking pan with parchment paper. (an 8x10 dish will work as well.) Place the strawberries in a large bowl and sprinkle with the sugar, cinnamon, salt and cornstarch. Stir to thoroughly coat and then let them sit on the counter for a few minutes while assembling the crust and topping. Stir together the oats, coconut, flour, sugar and butter. Spread half of the oat mixture over the parchment in the bottom of the pan. Pour the berries over the crust and then use your hands to sprinkle/spread the rest of the oat mixture on top of the berries. Bake on the middle oven rack for 30 minutes, until the crust has browned and the fruit mixture is bubbling. Let cool completely before slicing into bars, or use a spoon to scoop the warm crisp into bowls. 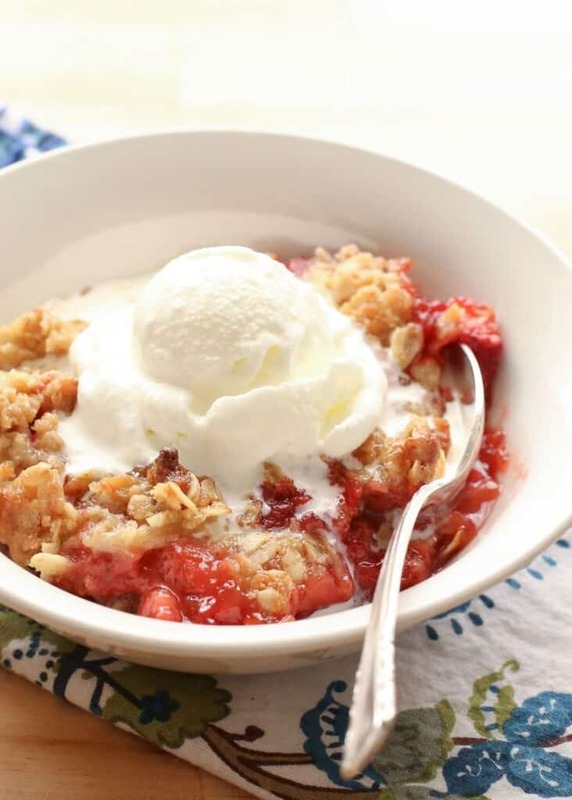 Serve with vanilla ice cream or vanilla bean whipped cream. Enjoy! We love coconut and I use it frequently. If you do not happen to be a coconut lover, swap out the cup of coconut with an additional 1/2 cup of oats and 1/2 cup of flour. It works great both ways. Oooh, these sound perfect. I am definitely a coconut lover but have never used it in a crisp - I'll be making these. Yay for strawberry season! Oh my word! That photo with the ice cream on top - so gorgeous! Love the pink color and everything about this crisp. Love these, especially with a scoop of ice cream on top. The perfect summer treat!! Recipe sounds wonderful. Have you ever tried to freeze these? 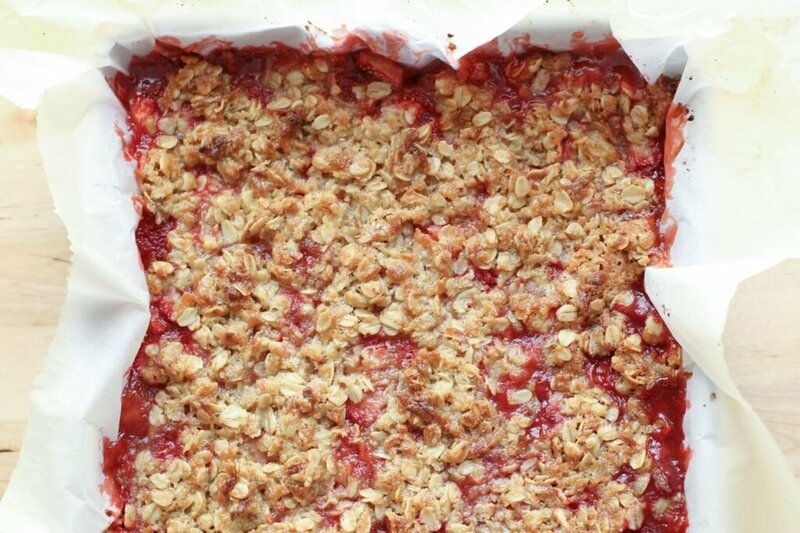 I haven't frozen this exact recipe, but I've frozen other berry crisps without any problems. It should be fine! Looks great! Do you suppose coconut flour could work in this? I imagine that it would, but you might need to add more butter. 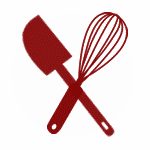 Coconut flour typically absorbs more liquid. If you do try it, please let me know how it works! Absolutely delicious! My husband and I could not stop eating these bars after I made them!